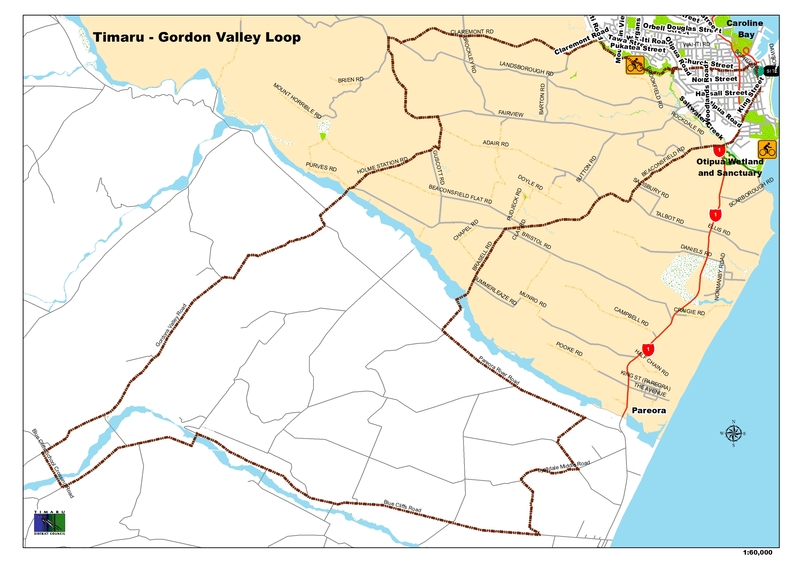 Starting on the western outskirts of Timaru, this ride takes you into the countryside to the west of Timaru, before continuing southwest to the Pareora, Blue Cliffs and Otipua areas. The area is rich in Maori and European history, and is also famous for its geology. 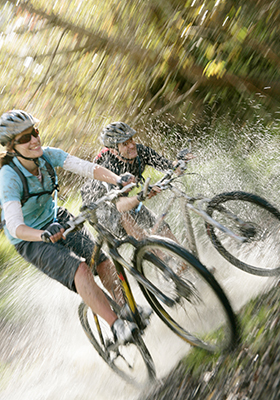 Your ride will take you through early farming settlements, past one of the South Island’s most stately homesteads, through ancient Maori Rock Art country and is also near to the famous Craigmore sinkholes. Return via southern Timaru and back to your starting point in Timaru’s western outskirts. Enjoy this easy ride of approx. 2.5 hours. The urban hub of South Canterbury, Timaru is just two hours drive South of Christchurch and a similar distance to Dunedin. Find out more about things to see and do in Timaru here. Park your vehicle in the carpark at the Southern Trust Events Centre in Morgans Rd. Turn left into Morgans Rd as you leave the carpark. Ride along Morgans Rd until you arrive at the Morgans/Pages Rd “T” intersection. Turn left into Pages Rd – after a short distance you will see a cycleway on your left to follow – note that this is a shared use path, designed for slow cycling and walking. At the “T” intersection just past the Gleniti Golf Course, turn right into Gleniti Rd. Continue on the gentle uphill incline until you reach Brockley Rd. Turn left into Brockley Rd. Follow Brockley Rd a short distance until you reach Claremont Rd. At the stop sign, turn right onto Claremont Rd, and continue on a gentle climb to Whale Bones Corner. This is the highest point on the ride, with great views towards both the sea and over farmland. The whale bones on display here were taken from the beach at Timaru and erected in the late 19th century at the corner for local landowner Mr John MacIntosh, as a landmark for visitors travelling to his nearby Kingsborough Station homestead. The shelter for this historic landmark was built as a community project in the 1980s. Nearby on Mount Horrible Rd (named after the volcano) is Castle Claremont, built in 1882 in neo gothic style by George Rhodes, as a wedding gift to his French bride, Henrietta. The Rhodes family were one of the most influential settler families in early NZ European history; the wedding of George and Henrietta was the first to be celebrated in the then new Christchurch Cathedral. Castle Claremont was built from of local bluestone and limestone by English stonemasons and finished with imported mahogany windows and fireplaces and English stained glass feature windows. The complex included a private Chapel and sat on 4,000 acres of farmland. 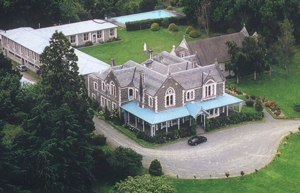 This historic home, which during its colourful history has also been Marist Brothers training centre and an alcohol and drug rehabilitation centre, has been popular in more recent years as a functions and wedding venue. At Whale Bones Corner, turn left into Fairview Rd for some pleasant downhill riding. Continue down Fairview Rd until you reach Holme Station Rd on your right. Turn right down Holme Station Rd and follow the road down into the steep zig-zag – take special care here. At the bottom of the zig-zag, continue along Holme Station Rd until you cross the Holme Station Bridge. Continue straight after Holme Station Bridge – you will soon see Pareora River Rd on your right. Do NOT turn left down Pareora River Rd, but continue straight. This is also Pareora River Rd. Continue (through the ford or over the bridge) and follow the road as it veers towards the left, until you reach Gordon's Valley Rd. On your right you will see the historic Holme Station Holmestead, one of the south island’s most grand estate homesteads, built in 1912 to replace the earlier homestead built in the late 1800s and destroyed by fire in 1910. Once the beating heart of one of New Zealand’s first and largest pioneer farms, Holme Station has in recent years been extensively and luxuriously refurbished, and is now a private residence. Turn right into Gordon’s Valley Rd. Ride along Gordon’s Valley Rd. Turn left into into Blue Cliffs School Crossing Rd. Continue a short distance until you come to Blue Cliffs Rd. Turn left into Blue Cliffs Rd. Continue along Blue Cliffs Rd until you reach Talbot Rd on your left. Turn left into Talbot Rd and continue until you reach Pleasant Valley Rd. Veer right into Pleasant Valley Rd and then hard left into Pareora River Rd. The wider area is known for its ancient limestone caves and overhanging rock shelves, which have formed hundreds of natural art galleries. A large number of New Zealand’s remaining ancient Maori Rock Art sites (approximately 300 sites) lie within a 70km radius of Timaru, Aoraki South Canterbury. Visit the Te Ana Ngai Tahu Rock Art Centre for a fascinating introduction to local Maori rock art and the most significant collection of Maori rock art in New Zealand. 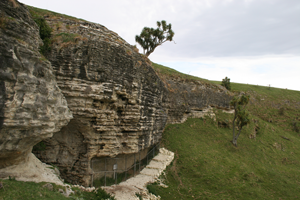 The area is also known for its cabbage trees and spectacular porous limestone sink holes, which are dotted over surrounding farmland. Turn right into Brasells Rd, cross the bridge and continue until you reach Beaconsfield Rd. Turn right into Beaconsfield Rd. Established in 1879, the Otipua (Beaconsfield) Settlement was part of the original Otipua estate, which at the time comprised about 30,000 acres of land. The property was later subdivided and thrown open for settlement, with the resulting township having a post office, blacksmiths and carpenter shop, and an attractive church which still overlooks the settlement. St Mark’s Anglican Church, consecrated in 1893, was constructed from local bluestone with Oamaru stone facings. The architect was Maurice de Haren Duval, a Belgian, who was in New Zealand for eighteen years from 1877 to 1895. Continue along Beaconsfield Rd until you reach State Highway 1 / King St. Points of interest along the way include the Otipua settlement (see above) and the Stables Café & Bar, set on another historic site. At State Highway 1 / King St, turn left and continue up the hill until you reach Otipua Rd on your left. Another stop popular with cyclists and walkers is the Wetlands Café, on your left before you start the uphill incline towards Otipua Rd. Turn left into Otipua Rd and continue until you reach the roundabout at Wai-iti Rd. Continue along Otipua Rd, you will pass on your left the Bowker Gates, named after George Bowker, a prominent local businessman who in the 1930’s donated 6.5ha of land adjoining the Otipua Rd reserve, to make access to the park, now known as Centennial Park Reserve, more accessible. Centennial Park follows the course of the Otipua Creek and an old railway line used to take the basalt boulders from the quarries at the site, to the Timaru harbour breakwater. Turn left into Wai-iti Rd until you reach Morgans Rd on your right. Turn right into Morgans Rd and return to the car park at the Southern Trust Events Centre.